Every time I walk through the doors of the Dutch Country Farmer’s Market, I’m hit with a heady aroma evoking nothing but happy thoughts—Saturday morning breakfast, still-hot apple pie, blueberry picking in the sunshine, cozy Sunday afternoon naps, and s’mores around a bonfire. It’s hard not to think happy thoughts when fresh bread is baking, bacon is sizzling at the lunch counter, and local produce is awaiting my shopping cart. And do you know why this place is so heart-warming and spirit-lifting? Because the Amish are in charge! The Amish know a good thing when they see it. That’s why I’m excited to introduce you to the Lancaster Farm Fresh Cooperative (LFFC). All seventy-five of the farmers in this non-profit cooperative are from Lancaster County, PA. If you know anything about the Amish, you know 30,000 of them reside in Pennsylvania Dutch Country, which includes Lancaster County. I was willing to place a serious wager (very un-Amish of me) on the majority of LFFC’s farmers being Amish. After some intense investigating, which just means I googled “Lancaster Farm Fresh Coop Amish,” lo and behold, I found the Frequently Asked Questions page of LFFC’s website. (I’m not much of an investigator apparently since I’ve been on their website several times and never noticed this easily identifiable page.) No matter how I got there, I was pleased to see that my suspicions were correct. The majority of LFFC’s farmers are indeed Old Order Amish. The best part of this discovery is reaping the benefits of some wholesome Amish goodness because LFFC has a CSA, and they deliver to Delaware! (And New York, Eastern Pennsylvania, and parts of Virginia and Maryland.) How exciting! 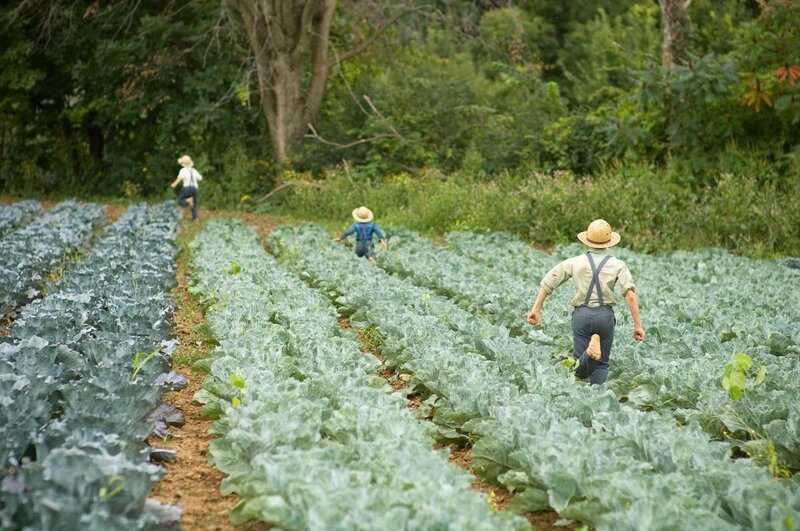 Even more thrilling is the fact that the farms are family-owned, organic and sustainable (thank you, Amish!). This means the produce is harvested when full of nutrients and delivered equally full of nutrients (and flavor) a day or so later to your pick-up location. One such pick-up location is Home Grown Café on Main Street in Newark. So how does the Lancaster Farm Fresh CSA work? You can buy a full vegetable share for an upfront cost of $725 (that’s only $29 a week for 25 weeks of the freshest produce) or you can buy a half share for an upfront cost of $450 (that’s only $18 a week for 25 weeks of the freshest produce). In June, your CSA box could look something like this: a bag of micro radish greens (fancy! ), 1 head red butterhead lettuce, 1 head green leaf lettuce (farm fresh lettuce is like heaven compared to grocery store lettuce), 1 quart new potatoes, 1 bunch sweet onions, 1 head broccoli, 1 bag garlic, 1 bunch orange mint (!! ), 1 bunch collard greens, and a couple of green zucchini. That’s a lot of produce! I can think of so many yummy ways to prepare it, too. A picture is worth a thousand words. 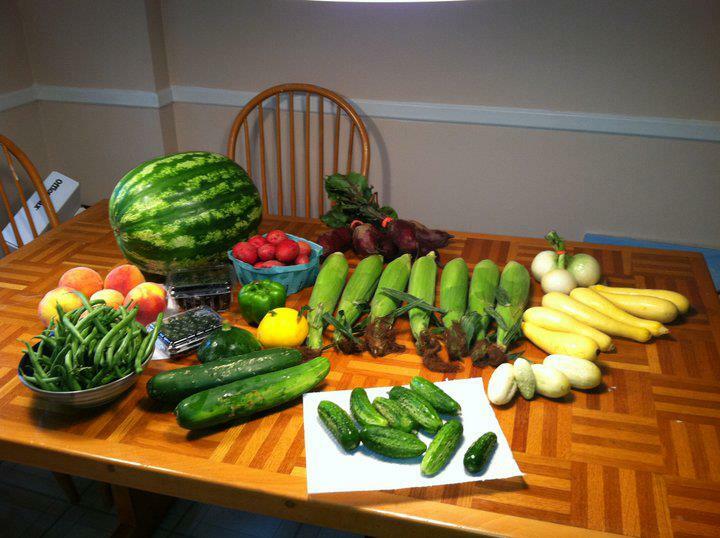 This is from LFFC's facebook page and shows a customer's full vegetable share for the week. I have one word: Wow! LFFC also offers a fruit share (local cherries! ), a flower share (sunflowers are my favorite), an herb and prepared food share, an egg share, and the best thing of all. . .a cheese share. For the low, low cost of $150, you will receive six deliveries of 1.5 to 2 pounds of local cheese (sheep, goat or cow). Unfortunately this option isn’t available in Delaware yet, but I may start a petition in hopes LFFC will share the cheese love. If you haven’t signed up for a local CSA yet, LFFC is still accepting applications. (Or if you’re not in the delivery area, find your own CSA at localharvest.org.) I’m getting my CSA box from Bayberry Farm this year, and I can’t wait until it starts in June. I’m pretty sure Toby, Bayberry’s farmer, isn’t Amish, but I still have faith in him. That is so awesome! I’m jealous!!! Can you believe how much stuff was on that customer’s table? Incredible. Everything looks so colorful, during the winter I get my produce from a farm located in Pennsylvania, excellent service. I don’t have to worry about it during the warmer months. We have about an acre of garden, and so grow our own vegetables. This year, I’m an additional plot to grow vegetables for the food closet where I’m a volunteer. I’m looking for more local options in the winter! Is your place in PA close to Northern Delaware at all? I’m so glad to hear that you’re growing a plot just for the food bank. My friend John donates every week. Happy Gardening! That photo is fantastic. Love our CSA but it’s definitely not Amish. I’m part of a CSA in Delaware, so depending how it goes, I may have to switch to this one. That was a lot of produce for one week! And like I said, you can’t go wrong with the Amish. Looking forward to seeing all the yummy goodness you get! I will be posting my week’s bounty once the CSA starts! Thanks for stopping by. great! Hope you will join my “What’s in the Box?” weekly link party! I am right now looking up in my area local farmers market info!